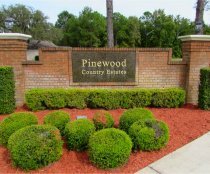 Pinewood Country Estates is a quiet community of 85 homes in northeast Polk County, Florida. The community is a mixture of family homes and rental vacation homes that were constructed in three phases from 1994 through to 1999. Pinewood Country Estates consists of 1 sail-shaped loop road with 2 bisecting roads and is surrounded by conservation woodland to the east and a lake to the west. Pinewood Country Estates is situated off Old Lake Wilson Road (CR 545) which runs from the US192 (Disney end) and is only 2 miles from Exit 24 on the I4. Disney World is only 10 minutes away and other Florida attractions are all within easy access.